I am using six Dahua 4Mp cameras(DH-IPC-HDW4421C) with Dahua NVR4208. These cameras can generate up to 32Mbps bitrate but NVR4208 accept only up to 10Mbps. This new 4K NVR’s specification says that it can accept up to 20Mbps bit rate. Does anybody know if it can accept 20Mbps bitrate from 6 cameras (i.e. 6*20=120Mbps)? Based on that camera specs it can do from 32K-10mbps for the bit rate. Also can do 4MP (1-20fps) and 3MP (1-30fps). The NVRs incoming bandwidth (combined sub and main stream) is 256mbps. It should be ok but I have to say this, your network will be running slow specially if your main goal is to access the unit remotely or from the web interface. I will recommend that you match the bit rate and fps on both motion and regular under encode type and reduce the fps on the sub stream to something lower so you can have fluent video preview over the network while viewing it from a phone or PC. My goal is to record main stream in maximum possible resolution and quality. 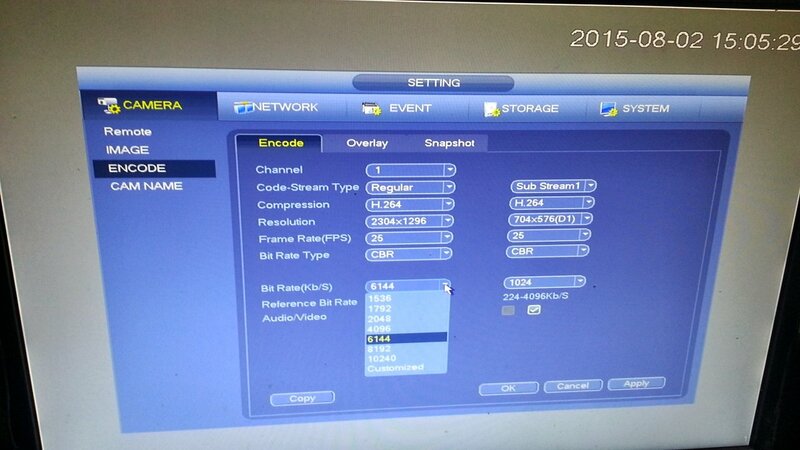 So I’d like to find NVR wich will be able to record from 6 cameras with 4MP resolution with 32Mbps bitrate. The question is – if NVR-ELE8M-4K will be able to accept 20Mbps bitrate from each camera on main stream? You are right! There is a mistake in the specs on chinese dahua site. The maximum bit rate for this camera is 10Mbps.